The exterior of a Barons Market. Courtesy photo. 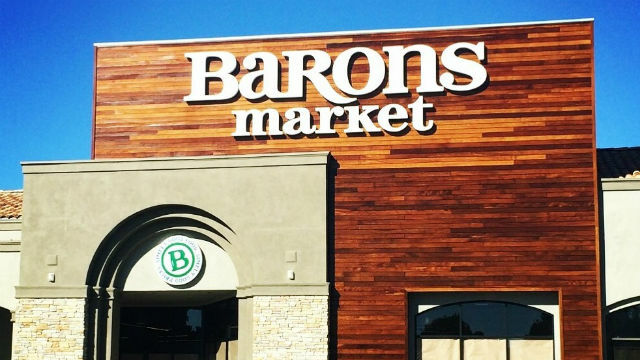 Family-owned Barons Market announced Monday the grocer has officially moved its headquarters to Poway. The company’s new home base is attached to its distribution center and will serve as a central location between its four stores in San Diego and three in the Inland Empire, according to Rachel Shemirani, Barons vice president of marketing. Twenty-five employees will work at the 10,000-square-foot office space and approximately 40,000-square-foot distribution center located at 12420 Kirkham Court, Shemirani said. Barons Market first opened in 1993 as a neighborhood grocer. The company plans a 2018 opening of an eighth store in Menifee, a city located in southwest Riverside County.